Sorority Graduation Cords are a great way to show off your membership in a Greek Letter Organization with your cap and gown on graduation day. Our honor cords come in a wide variety of colors, and color combinations and can tied to make even more combinations. 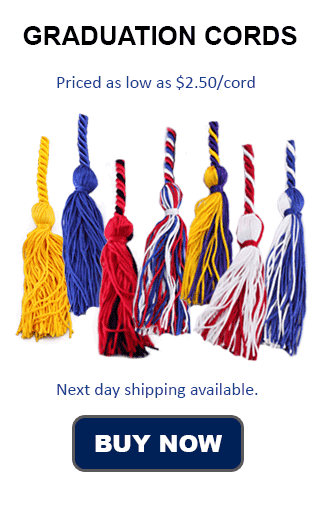 There is sure to be a combination of graduation cord colors that fit just about every sorority out there. The cords are standard length and of the highest quality. Sure to please even the most discerning admirer of graduation memorabilia. Sometimes Sororities use greek letter sashes, or greek stoles to commemorate their being included in a sorority at graduation. Another great way to show that is, of course, the honor cord. Our honor cords are made of rayon and feature vibrant colors.